NEWTON COUNTY, Ark. 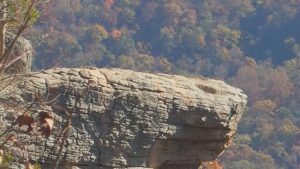 (KYTV) – Authorities say a 20-year-old woman died Saturday after falling off a cliff in Newton County, Arkansas. The student from South Dakota fell about 100 feet after witnesses say she re-positioned herself for a photo and slipped. Newton County Sheriff Glenn Wheeler said the area is one of the most popular places in the state for hiking photos and said his office gets about five to 10 calls a year of people falling or getting hurt. There have been calls for fencing to be put up along the cliff side, but the sheriff said that would take away from the natural beauty of the area.